They say imitation is the sincerest form of flattery – but knock-offs aren’t always on par with the original. Aprilaire is the trusted leader in Indoor Air Quality and indoor air filters. It has been for the last 60 years. If you trust Aprilaire products in your in home, it’s important to keep them running with Genuine Aprilarie Replacement Parts to ensure maximum performance. 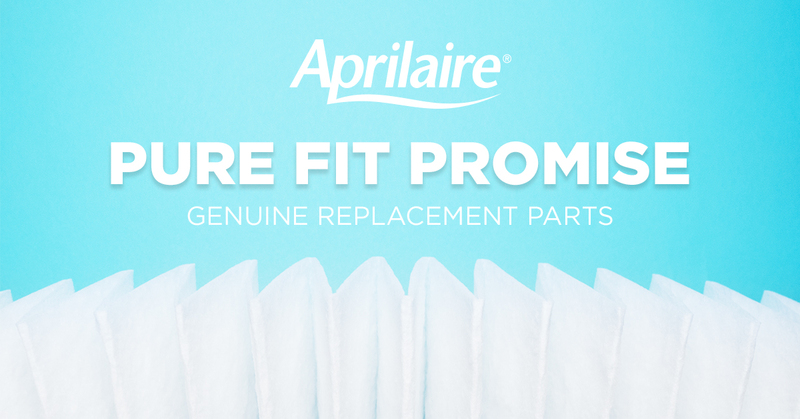 Only Aprilaire replacement parts come with the Pure Fit Promise. Aprilaire air filters come with the Pure Fit Promise. Aprilaire humidifiers and air cleaners require an annual replacement of their water panel and air filter, respectively. These components and patented designs are the heart of the product. You may find filters and water panels in stores that claim to offer the same performance. But don’t trust your family’s health to anyone but the experts. Buying directly from Aprilaire or from an Aprilaire dealer, gives you confidence you’re getting the right size filter and the performance-level you expect. Genuine air purifier filters from Aprilaire are designed with a super-tight seal between the filter and furnace. This is important because filters without this design allow air to travel under, around and above the filter. To get the most out of your air purifier, you need to use the correct Aprilaire filter. Aprilaire Air Purifiers come with an amazing clean coil guarantee, which ensures the cleanliness of your air conditioner coil and the performance of you HVAC system. However, because of the noted differences between Aprilaire and other brands, you must use genuine parts. Our humidifiers and air cleaners have a 5-year warranty when they are installed by a professional contractor and the proper replacement parts are used. Protect your investment in better air by always using genuine Aprilaire parts. As summer winds down and you get ready to have your HVAC system tuned up for the winter, make sure your contractor replaces your air filter with genuine parts. You can also purchase the correct replacement filters and water panels direct from Aprilaire. Previous Previous post: Ask Aprilaire: What Can Your Alexa Skill Do for You?